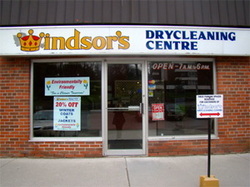 Windsor’s Drycleaning Centre opened in 1952 by the late Hayley Windsor. Over the years, the Windsor name has been associated with quality cleaning and professional pressing and finishing. Although the name changed several times from Twin Cleaners in 1952 to One hour Martinizing in 1977 to Windsor’s Drycleaning Centre in the late 1980’s,superior quality cleaning and professional pressing and finishing of garments was the focus of Mr. Windsor’s success. In 1994, the business was purchased by Bruce & Krista Thompson who worked to keep the reputation of quality cleaning and excellent service. They offer in-town delivery as well as being a wholesaler to 4 satellite drycleaning stores. Expansion in the early 2000's brought Linen Rentals & Environmentally Friendly Cleaning processes. The Environmentally Friendly Drycleaner in Peterborough.